East London duo Honne have quickly established their status as connoisseurs of irresistibly smooth, baby-making electro-soul. Critically acclaimed electro soul duo Honne formed in Bow, London in 2014, releasing two debut EPs the same year. Ever since, the outfit has honed an immaculately-produced, unique and easily-identifiable sound, culminating in the hotly anticipated release of their sophomore album 'Love Me/Love Me Not' in the Summer of 2018. Don't miss them as they hit the road in support of this latest offering on an expansive North American fall tour. A concept album of sorts, 'Love Me/Love Me Not' finds James Hatcher and Andy Clutterback exploring the ups and downs falling in love, a concept that divides the LP into a lighter and darker half. As always, they offer their listeners danceable yet intelligent music that mixes shades of funk, R&B and blue-eyed soul with satisfying and thoughtful lyrical content, as well as a few brazen pop hooks thrown in for good measure. As such, their live shows are a reflection of this obvious musicality, resting on technically remarkable and emotionally-charged performances that often have audiences hushed in silent revery. Sound good to you? 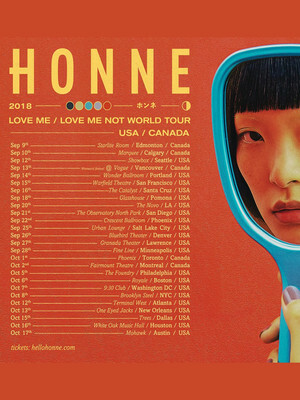 Share this page on social media and let your friends know about Honne at Wonder Ballroom. 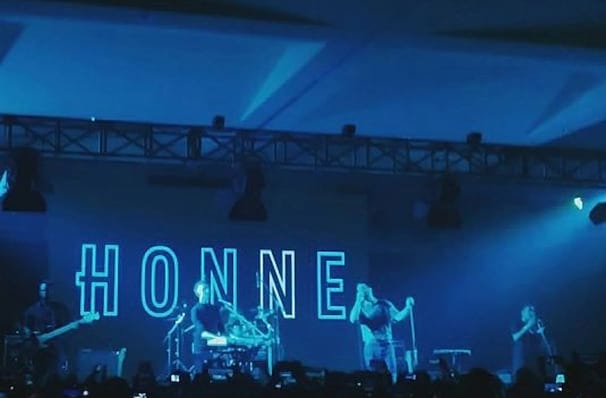 Please note: The term Wonder Ballroom and/or Honne as well as all associated graphics, logos, and/or other trademarks, tradenames or copyrights are the property of the Wonder Ballroom and/or Honne and are used herein for factual descriptive purposes only. We are in no way associated with or authorized by the Wonder Ballroom and/or Honne and neither that entity nor any of its affiliates have licensed or endorsed us to sell tickets, goods and or services in conjunction with their events.